A versatile equipment to heat slides with just microtomed sectionsto attain maximum flatness before Staining. Temperature rangeambient temperature is thermostatically controlled. 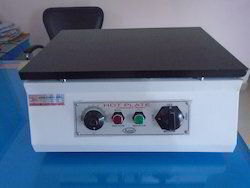 It is very useful for heating slides to a uniform constant temperature below the melting point of wax. The surface temperature is controlled by hydraulic type thermostat from ambient to 700°C supplied complete with pilot lamp. Cord but without thermometer. To work on 220/230 Volts. AC. supply. 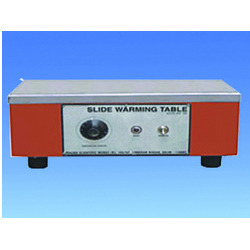 We are the standout firm which has earned name and fame in providing Slide Warming Table to the patrons. Machines which we offer have resistance against corrosion, accurate dimensions and robust construction. Thermostatically controlled uniform temperature from room to 80'C top made of anodized aluminium / stainless steel. - It is very useful for heating slides to a uniform constant temperature below the melting point of wax.